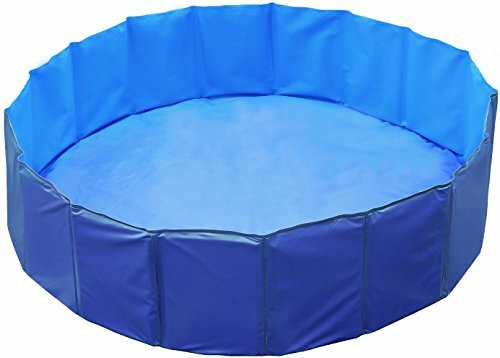 This foldable pool provides a safe and comfortable place for pets and even toddlers to bathe, swim and dabble at home or in travel at beachside. You can even turn it into a ball pit or cooler easily with different filling. It easily unfolds to stand upright on its own for easy water filling without inflation and the built-in drain plug makes drainage just as easy. Heavy-duty PVC material enables easy clean and prevents against punctures for durability. EXCELLENT BATHING TUB & SWIMMING POOL - Makes for a great bathing tub and swimming pool for pets and toddlers. 5.2ft wide and 1ft deep. EASY UNFOLDING, WATER RE-FILLING, & STORAGE - Unfolds easily without inflation. Easy water filling and drainage with built-in drain plug. Collapses down for travel and storage. DURABLE & HEAVY DUTY - Durable heavy-duty PVC material prevents against punctures. WORKS ON NUMEROUS SURFACES - Collapses down for travel and storage.